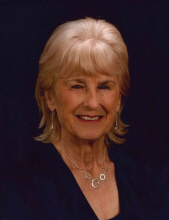 Shirley J. Burgett passed away February 8, 2019. She was born on September 18, 1935 in Independence, Missouri to Orville and Marion Harrington. Shirley is survived by 5 children; Jeannie Johnson (Mike), Joy Murray (Keith), Harold "John" Burgett, Jr. (Lois), Janet Burgett Martin (T.J.) and James Burgett (Lauri), sisters Frances Cofer (Glen), Deanna Deason and brother Richard Harrington, 13 grandchildren and 18 great-grandchildren. In addition to her parents, Shirley was preceded in death by her loving husband Harold Burgett, brother Dempsey Harrington and sister Carol Ogden. Shirley was the devoted matriarch and dedicated her life to her family and the Lord Jesus Christ. Services will be held on Wednesday, February 13th at Heritage Funeral Chapel, 6830 W. Thunderbird Rd. Peoria. Visitation will be from 9:30 AM - 11:00 AM and service to follow at 11:00 AM. Shirley will be laid to rest with her husband Harold at the National Memorial Cemetery of Arizona. Graveside Service will begin at 1:30 PM. In lieu of flowers, please donate in Shirley's name to the Phoenix Rescue Mission at 602-346-3336 or by visiting their website prm@phoenixrescuemission.org. To send flowers or a remembrance gift to the family of Shirley Jean Burgett, please visit our Tribute Store. "Email Address" would like to share the life celebration of Shirley Jean Burgett. Click on the "link" to go to share a favorite memory or leave a condolence message for the family.